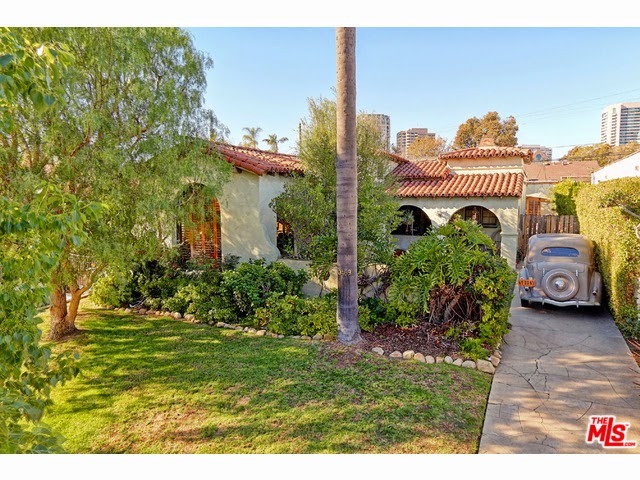 The Westwood Real Estate Market Blog: What Did That Westwood Home Sell For At 10469 Kinnard Ave? What Did That Westwood Home Sell For At 10469 Kinnard Ave? The Westwood home at 10469 Kinnard Ave LA CA 90024 lasted about 6 days on the market before accepting an offer on 1/13/14. This 20's Spanish has a little bit of remodeling and is in a move in type condition. The upgraded kitchen with granite counters, stainless appliances and newer cabinetry was the move obvious upgrade in the house. The bathrooms looked to be more original. The vaulted ceilings in the living room were very interesting with the stencil painted ceilings and wood beams. With a sale price of just over $1,000 a square foot, this is one of the more expensive homes that has sold on a per square foot basis in the neighborhood in awhile. The house sits on the 10400 block of Kinnard, which is not a through street all the way to Beverly Glen. This cuts down a little bit of any drive by traffic trying to cut through to busy streets. On 2/13/15, 10469 Kinnard Ave closed about 5.4% over the asking price at $1,660,000 |$1001 $/sf|. According to the MLS, the home is 3 bedrooms/ 2 baths, 1,658 sf of living space on a 6,500 sf lot.